If someone had told me a year ago I would be running regularly with not one, not two, but three partners, I would have scoffed at the notion with a "no way - never". Afterall, in all my years of running (20+), it's always been a solo gig. Running has always been a refuge of solitude for me - an escape from the chaos of every day life. I never wanted to impose my pace on another person and felt the same way. Plus, I didn't know too many runners who liked running at 5am. So, how I ended up with 3 running partners seems pretty random now - several chance encounters, common pasts, one common goal and voila - a running quartet. I now regularly run with three guys I call "The Professors". I know that may conjure up visions of old men in tweed jackets, but these guys aren't too old and certainly don't wear tweed (that I know of - I've only seen them in neon yellow jackets). Naresh, Andy and Dan are PhDs and Professors at the University. Obviously, I am the "one of these things is not like the other, one of these things just doesn't belong" on SO many levels here (yeah, I run the slowest, too). Naresh and Andy have run together for years. Andy and I happen to share a common past - we graduated from the same class at MIT, but somehow our paths never crossed back in college - weird because I know his wife (she also graduated from MIT) and when we play the "do you know so and so" game, it's always "yeah, I know him / her". Dan joined in - he is the fastest runner of the group, attempting to qualify for Boston. Naresh, Dan and I live less than a mile apart in the same subdivision, so it has been easy for the three of us to meet up in the cold, dark mornings. Running with a group has its advantages - there's always interesting conversation (Andy always recounts some hilarious circumstance), so the time and miles pass by quickly. Having people to run with this harsh winter kept me on track with the running program. If I didn't have someone expecting me to show up on the snowy, cold streets at 5:30, I would have run a shorter distance inside on the treadmill or stayed in bed. It's peer pressure at its best - we've braved crazy blizzard conditions, sub zero temperatures, and drenching cold rains together. They've watched me slip, fall on the ice and helped me get back up. Andy complains a lot and we get to listen. We've also run through the soft snow, viewed several beautiful sunrises and watched the cold winter morph into spring (even if it doesn't feel like spring yet). I know that running with a group of guys is a little "different" (I tend to get weird looks from my non running female friends when I tell them my weekend running plans and who I'm running with), but I'm an engineer and have been surrounded by men most of my life - I'm used to it. At the end of the day, we're simply runners driven by the same inexorable goal to go further or faster. Achieving those goals together has resulted in a special camaraderie, one I wouldn't trade. 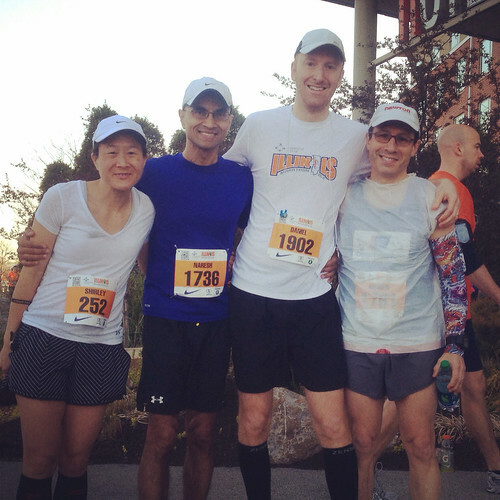 Edited on May 9, 2014 to add the photo taken right before we all ran the Illinois Marathon. These guys are very special to me.